I Am Shark fulfils the sci-fi fantasies of Star Wars fanatics and vinyl lovers alike with the limited edition 2XLP gatefold vinyl repressing of the John Williams scored original soundtrack to Star Wars Episode I: The Phantom Menace. 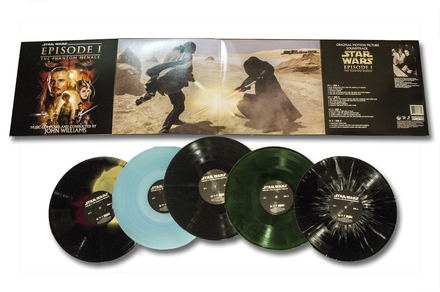 Recorded by the London Symphony Orchestra and London Voices, the soundtrack is available in Darkside (180 Gram Black), as well as four other limited character coordinated color themes including Obi-Wan Kenobi (Translucent Blue), Qui-Gon Jinn (Green/Brown Marble), Darth Maul (Red/Gold Stripe on Black), and Hyperdrive (White Splatter on Black). I Am Shark will soon complete the soundtrack trilogy, following Episode I with the first ever vinyl pressings of the Star Wars Episodes II and III soundtracks. The Star Wars Episode II: Attack Of The Clones vinyl soundtrack will be released this coming January, 2016. Release date and preorder information to be announced in the coming weeks. Recorded at Abbey Road studios over the course of a week, starting on February 10, 1999, Star Wars Episode I: The Phantom Menace was the first Star Wars score Williams had composed in over 16 years. The scores of the following two films in the prequel trilogy would rely heavily upon tracking from this score, a decision that Williams and George Lucas had made early into production of the film. The original album was released on CD to accompany the film (May 4, 1999), and was certified Platinum in the U.S. and Gold in the UK. The limited edition vinyl release of Star Wars soundtracks marks I Am Shark’s emerging role as an independent label for Film, TV, and Video Game soundtracks. Future soundtracks from iconic pop culture and beloved indie releases will be announced in the coming months. Officially Licensed by Sony Music and Lucasfilm LTD.